If you ever want to get back at me for any reason, just point nonchalantly toward my head and casually mention, "Hey, Kim, there's a daddy long-legs in your hair." Then sit back and laugh heartily as I FREAK OUT. I try very hard to hide my fear of arachnids whenever my children are around. I certainly do not want to teach my daughters to shriek and cry at the mere sight of an insect. Or a mouse. Or my pasty white legs in shorts. If one of my girls happens to show me an 8-legged monster scuttling across a wall, I'll very calmly call to my husband, "Hey, honey, I've got work to do in the kitchen. Would you mind taking care of this spider for me?" which he knows is code for GET IN HERE RIGHT NOW BEFORE I LOSE CONTROL IN FRONT OF THE KIDS. Yes, I see, sweetheart. Just a little ol' spider spinning his web. No big deal at all. Let's go now. Quickly, please. Mommy needs to go to the bathroom and scream into a towel. When Son #3 was a few years old, I figured out I'd better get less squeamish about bugs and creepy crawlies With three boys in the house we had more than our share of them over the years, and I'm proud to say I held my own. Now I don't freak out unless something jumps right at me. Lately we have been having grass spiders in the house that are the size of my palm. I don't freak when I see spiders, for me, it's the scorpions. I scream for one of my kids to kill it. They all went back to school today. Now what the heck am I gonna do? So does it mean my kids are forever damaged that I freak out completely whenever I see a spider? Now, they freak out when they see one in the house...so I guess I just answered my own question. 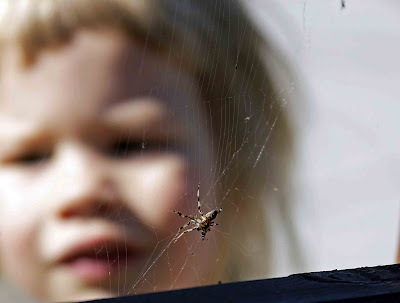 That picture is spectacular...I love how your daughter's image is blurred while the spider is in focus. I couldn't take a picture like that to save my life! Your photography skills are amazing!! BTW, so far Cole and Bella are doing well in separate classes. On the 3rd day, when I picked them up and I asked them, "Do you guys miss each other at all?" they both said no. And then Cole added on, "It's awesome, like we're not even twins!" Or, I mean, it MUST be genetic...sheesh!! I hate spiders. With a passion. I try not to freak in front of my girls, but one time I lost it over fake plastic spiders. I couldn't help it. Now my girls are terrified of spiders. Oops. I am right there with you. Spiders freak me out. Seriously, I couldn't even look at the photo.